Our first years have made a clean sweep of all competitions this year and have won the Cork, Munster and All-Ireland titles. The Munster competition kicked off early in the year where Ballincollig Community School were the visitors to Pfizers. A hat-trick from Dylan Ward and a penalty from captain Gordon Walker were enough to see Roco win 4-1. This was followed up by an excellent win against a very strong Pres team where Roco ran out 4-3 winners in a match that could have gone either way. Goals from Stephen Fox and Dylan Ward (2) before Donagh Gribbon hit the winner 10 minutes from time. Next up in Munster were a very well organised and fit St Colmans side but Roco just managed to win 2-1 with goals from Dylan Ward and Donagh Gribbon. In the last 16 Roco faced Colaiste Don Iascaigh of Cahir and won 5-1 after a very impressive performance and goals from Aaron Long, Stephen Fox, Donagh Gribbon, Brion O Callaghan and a wonder goal from left back Jack McCarthy. Last Years Munster Finalists Mercy Mount Hawk were the opposition in the Munster Quarter Final which was another thrilling game in the sunshine in Tralee. Roco took the lead after 10 mins after a clever through ball from Stephen Fox found Man of the Match David Nason who slotted the ball past the oncoming keeper. Mount Hawk responded almost immediately from a corner to make it 1-1. With the aid of a strong breeze Roco took the lead 5 mins before half time with a superb counter attacking move involving David Nason, Stephen Fox, Aaron Long and David O Sullivan and it was Donagh Gribbon who rounded the keeper to give Roco a 2-1 lead at half time with Roco keeper David O Keefe pulling off a world class save just on the half time whistle to keep it at 2-1. Against the breeze in the second half, Roco got a dream start when David Nason played a superb ball onto the ever running Donagh Gribbon who excellently lobbed the keeper to give Roco a two goal cushion. Despite Mount Hawk piling the pressure on, Roco kept their heads and went on to score another through Stephen Fox 10 mins from time to make it 4-1. However there was still time for more drama as Mount Hawk managed to pull one back and for 5 mins looked very dangerous and threatening with the score at 4-2. However, Stephen Fox broke away in the last minute to score his second and Roco’s 5th. Mount Hawk would score a penalty with the last kick of the game to make the scoreline 5-3 and that’s how it finished. The semi final against St Brendans, Killarney was a very tight affair with Rochestown giving yet another superb and dominant performance. Rochestown took the lead after 20 mins when Stephen Fox finished off a fine through ball from Dylan Ward. It was just what Roco deserved having dominated the play up to that. Brendans came into it more in the second half and grabbed an equaliser with 10 minutes remaining that came against the run of play and sent the game into extra time. Roco again started off in the accendency and with 5 minutes remaining in extra time, Donagh Gribbon finished off a superb team goal involving a number of excellent passes down the left wing and a fine cross from Dylan Ward. There were great performances all over the field with David Nason getting Man of the Match for the second gamed running. 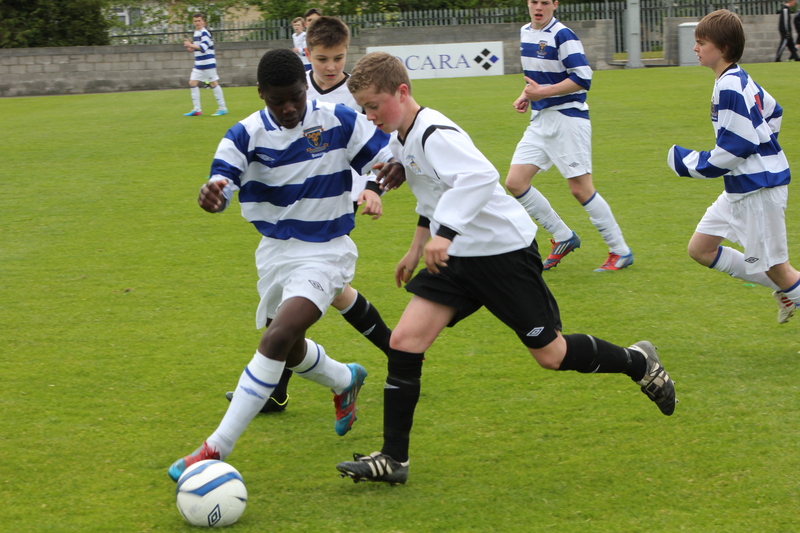 The final against Pres’ was Roco’s fourth final in five years in the First Year Munster Cup. Roco faced Pres’, whom they beat earlier in the competition but knew it would be a very difficult game. Roco got a dream start when captain Gordon Walker scored after 3 minutes from a Donagh Gribbon corner. Roco completely dominated play until 10 minutes before half time when Pres’ got a goal against the run of play. However, Roco quickly went back in front when the excellent David O Sullivan volleyed in from close range after a Donagh Gribbon corner to leave the score at 2-1 at half time. The second half was a tight affair with both teams pushing forward and it was Pres who got the equaliser with 15 minutes remaining to leave a tense finale to the game. However, as they always seem to do, Roco didnt take long to respond and got the deserved winner when Dylan Ward played a through ball and Donagh Gribbon managed to get there before the keeper to score the winner with 8 minutes remaining. A fantastic overall performance with superb individual performances throughout. Roco celebrated with the extended Roco support at Corrinthians who made their presence felt. The All-Ireland semi-final against Lucan CBS was played under very windy conditions at Ozier Park, Waterford. Roco played with the aid of the wind in the first half and deservedly went in front 10 minutes in when Gordon Walker finished off after a goalmouth scramble. Lucan grabbed a very fortunate equaliser just before half time when a long ball was headed into his own net by Gordon Walker as he stretched to meet the cross. Despite playing against a heavy breeze, Roco had the better chances in the second half with David O Sullivan unlucky to see his effort hit the crossbar. Roco would hit the post twice more in extra time and really tried to push on and get the winner. However, the match would go to penalties and after Donagh Gribbon and Brian Turnbull scored Roco’s first two, David O Keefe pulled off a magnificent one handed save to give the advantage to Roco. Stephen Fox, Aaron Long and Dylan Ward completed their kicks to send Roco through to their second first year All-Ireland final in 4 years. The players effort was immense and they were greeted like heros at the final whistle by the extensive Roco support. The All-Ireland final at the Oscar Traynor Centre on Wednesday May 22nd was against the Connacht Champions, St Enda’s of Salthill. Rochestown struggled in the first 15 minutes with the sheer size, height and physicality of the Salthill team and found themselves behind after 5 minutes when St Enda’s hit an unstopable piledriver from outside the box into the top corner, leaving David O’Keefe with no chance. Rochestown were struggling to impose their game on a far bigger team but kept their heads and as the half grew on so did Roco with Dylan Ward causing problems down the Roco left and Stephen Fox finding more space in midfield. Roco finished the half strongly and you could feel the self belief growing as the half came to a close. The second half continued the way the first half finished with Roco working very hard and having lots of possession but causing no threat to the St Enda’s goal. On 45 mins, Jack McCarthy replaced Aaron Long, allowing Gordon Walker to push on in search of an equaliser. This move brought Roco to life with the back four now looking comfortable and Roco now winning the midfield battle. Roco tore at St.Enda’s with Dylan Ward, Brian Turnbull and Gordon Walker all beginning to cause big problems for St. Enda’s. With Two minutes remaining, a Stephen Fox free kick was cleared by the Enda’s keeper but was hooked back in excellently by David Nason and there was Gordon Walker to rescue the game for Roco with a close range header. It was thoroughly deserved. Roco dominated possession during extra time but it was Enda’s who had the better chances with Jack McCarthy making a match saving tackle and Brian Turnbull clearing off the line after a goalmouth scramble. In the penalty shootout, the clearly injured Donagh Gribbon and Stephen Fox scored Roco’s first two penalties before David O’Keefe saved Enda’s third to give Roco an advantage. It was short lived as the excellent Brian Turnbull’s penalty was saved. Gordon Walker and Dylan Ward would complete Roco’s five penalties to bring the penalties to sudden death. David O Sullivan and Ger O Mahony scored for Roco before Enda’s hit the post with their seventh penalty to make Roco the All-Ireland Champions for the first time. The crowd went crazy and Gordon Walker collected the First Year Cup in front of a huge Rochestown crowd. In the Cork cup, Roco travelled to Mayfield and won comfortably with goals from Dylan Ward (2), Gordon Walker, Stephen Fox, Aaron Long and Donagh Gribbon. In the quarter final against CBC, Roco started without three main first team players due to injury and really found the going tough against a very well organised CBC team. However, the resilience of the team really came through and the team battled back twice to draw level with two penaties from Donagh Gribbon and went on to win the peanlty shootout in dramatic style after a terrific save from Sean Foley. This was the best performance to date for many of the players who really showed terrific character and none more so than captain Gordon Walker who was immense. In the semi final against Douglas, Roco encountered probably their toughest test to date with Douglas very difficult to break down and very dangerous on the break. Keeper David O Keefe made some excellent saves in the first half to keep the score at 0-0 at the break. 15 mins into the second half, Roco hit a killer blow when Donagh Gribbon chipped the Douglas keeper from a narrow angle to give Roco the lead. With Douglas pushing on to get an equaliser, Roco broke away with 5 mins to go with Stephen Fox getting the vital touch from a Donagh Gribbon cross to give Roco a 2-0 win and a final date with Ballincollig Community School. In the final against Ballincollig, Roco were under pressure early in the game and lost Aaron Long after 15 minutes due to injury. Jack O’Mahony replaced him and went on to have an excellent game at right back as Roco came more and more into the game with Dylan Ward causing a lot of problems down the left wing. Roco broke the deadlock 3 minutes into the second half with a well finished goal by Stephen Fox. Stephen went on to get a second 10 minutes later with a great individual goal to put Roco in the driving seat. Ballincollig’s pressure did pay off with a consolation goal in the dying minutes but Roco won through to win an unprecedented treble. What a year!